In an age of endless email and chat communications, it’s never been more important to communicate insights succinctly and clearly. But explaining charts and graphs—especially complex ones—can seem daunting without presenting in person. That’s why I rely on quick annotation tools like Skitch—which enable me to point out specific data and provide insights directly on top of a beautiful chart or graph in a matter of minutes. I just snap a screenshot, drop it into Skitch, point out a number of different trends, and then copy-paste the annotated graphic in an email, Slack or Glip message for others to see and respond to. Start with a screenshot of a great chart or graph. That way you don’t waste your time building a visualization from scratch. Klipfolio, Mixpanel, and Google Analytics all offer wonderful screenshot-ready charts, graphs and tables. Use command-shift-C to copy the annotated Skitch, and then paste it anywhere! I'm especially fond of pasting Skitch-annotated charts and graphs into Slack, Glip, Spark, and regular old email. 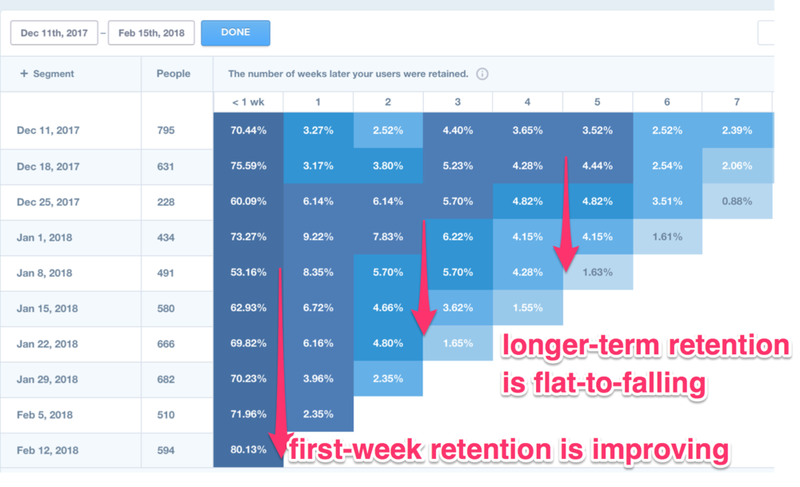 Platforms like Mixpanel have wonderfully robust retention tables (and other visualizations), but oftentimes your audience needs a little hand-holding through such complex charts. Skitch to the rescue! Dashboards powered by super flexible platforms like Klipfolio enable Business Intelligence experts to pack a ton of data into a compact space. But sometimes the relationships between different data tiles aren't entirely clear. Two Skitch arrows and some bold companion text helps hand-hold your audience towards an analytical conclusion! Sometimes you'll need to share charts and graphs which contain sensitive information. Skitch makes this super simple with its Pixelate tool, which will blur out any sensitive data by drawing a box over it. I've done just that with the twitter handle above (to protect my client's identity) and in the chart below (shared with a 3rd party vendor to point out a data discrepancy). Hopefully this post will help get you well on your way to producing succinct and effective annotations on top of charts and graphs. Feel free to contact me if you’d like to learn more about visual storytelling with data, and happy Skitching!